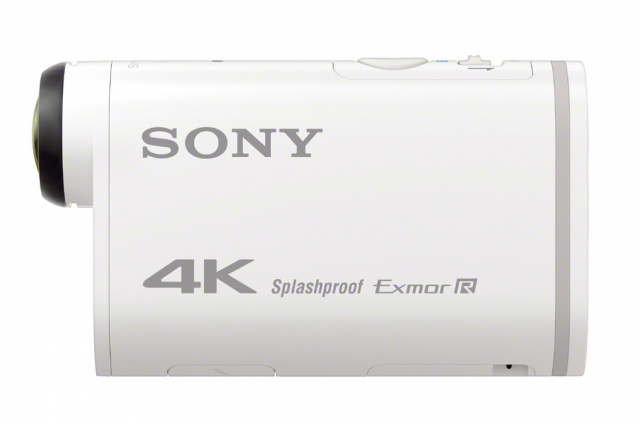 Sony Electronics, a worldwide leader in digital imaging, has introduced its most powerful POV camera to date, the 4K Sony Action Cam. The new camera applies the company's expertise in 4K video production to a compact, splash-proof POV camera design, which can be played back on a compatible 4K TV directly from the camera through HDMI. It also features enhanced HD video performance with upgraded stabilization, image quality and high-frame rate shooting. The FDR-X1000V features Zeiss' ultra-wide angle lens, a back-illuminated sensor and an acclaimed processor, ensuring that video quality remains consistently strong across all shooting environments. The camera features an updated version of Action Cam's leading SteadyShot™ allowing for electronic image stabilization. It also shoots HD video footage at extremely high frame rates of 120p in Full HD and 240p in standard HD for slow-motion footage, and has clean HDMI output for recording to an external device. On the audio front, the new Action Cam adds wind noise reduction that minimizes wind interference with the stereo microphone. There is an expanded scope of manual controls and setting adjustments including white balance, and auto exposure shifting. Loop recording is also available, allowing users to maximize usage of available memory card space to ensure they get the exact shot they are looking for. In addition to the new 4K model, Sony has also introduced the Action Cam HDR-AS200V, which shares many of the same advanced features and exciting technologies as the FDR-X1000V including full pixel readout image, image stabilization, clean HDMI out and upgraded manual controls, yet lacks the 4k capability. The FDR-X1000V and HDR-AS200V cameras are equipped with built-in GPS and Action Cam Movie Creator, allowing users to utilize the provided software to produce custom videos with GPS Data Overlay as well as merge multiple video files together with music. For an additional $100, a Live View Remote (waterproof up to 10 ft.) allows for control over the FDR-X1000V and HDR-AS200V action cam including start/stop recording, movie playback (without sound) and deletion of unwanted files. Utilized with Sony's mobile application, multiple different cameras can be controlled simultaneously via Wi-Fi – available for both Android and iOS. Pair these new cameras with a variety of new accessories for the expanding Action Cam lineup, including a helmet side mount, a board mount that adheres safely and securely to a snowboard or surfboard. The FDR-X1000V is priced at $500 and is packaged with a waterproof case, while the HDR-AS200V runs for $400 and includes a waterproof case and standard tripod mount. Both cameras and camera bundles will be available this March at Sony retails stores, online, and other authorized dealers nationwide.